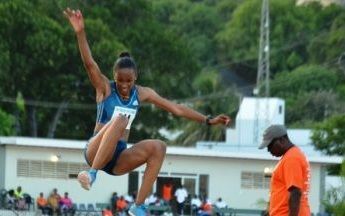 You are here: Virgin Islands News Online » News » Chantel Malone leaps to CAC Gold in Mexico! Chantel Malone leaps to CAC Gold in Mexico! VERACRUZ, Mexico – Virgin Islander Chantel Malone today November 25, 2014 did the Territory proud at the Caribbean and Central American (CAC) Games in Veracruz Mexico by winning the gold medal in the women’s long jump. Malone leapt a distance of 6.46 metres in her championship effort which left her competitors in the dirt and sealed her the win. However, her compatriot Tahesia Harrigan-Scott finished a disappointing 8th in the 100 m women's final with a time of 11.93. Laverne Jones of the United States Virgin Islands grabbed bronze with a time of 11.54 behind Venezuela pair, Andres Purine and Nedium Vargas who ran 11.29 and 11.43 respectively. More to come in a subsequent article. Our girl finally did it! Congratulations Chantz.........from the TNTC fam! Booommmm!!!! YYYYEEEEESSSSS!! Congratulations, Chantel! So proud, SO PROUD! Thanks for always trying your best to represent us, T. Still proud of you, always. Proud of you Chantz! You go girl! Did myron used his own money to go to mexico on that joy ride????? Really @ big question!!. Good Myron, bad Myron. That is NONE of your dam business. Stop being messy. How come he didn't take a picture with those bvoslanders that didn't do well in mexico??? Preparation is KEY to success -- Gold is no surprise -- Keep up the GREAT work! Tahesia, you've represented the Virgin Islands well for several years and have made us very proud. But it's time to pack it up. There was a time when you could run 11.29 in your sleep. 11:93 ?? Nah man. Time to pass that Baton to Nelda.